Nuts are one of my go-to snacks. Loaded with protein and healthy fats, they can help curb your hunger pangs without making you feel guilty about having a little snack. Plain nuts are good, but I like a little more flavor. The only problem is that I find most flavored nuts you buy in the store are generally full of not-so-good-for-you ingredients that negate the health benefits. Needless to say, I make my own. 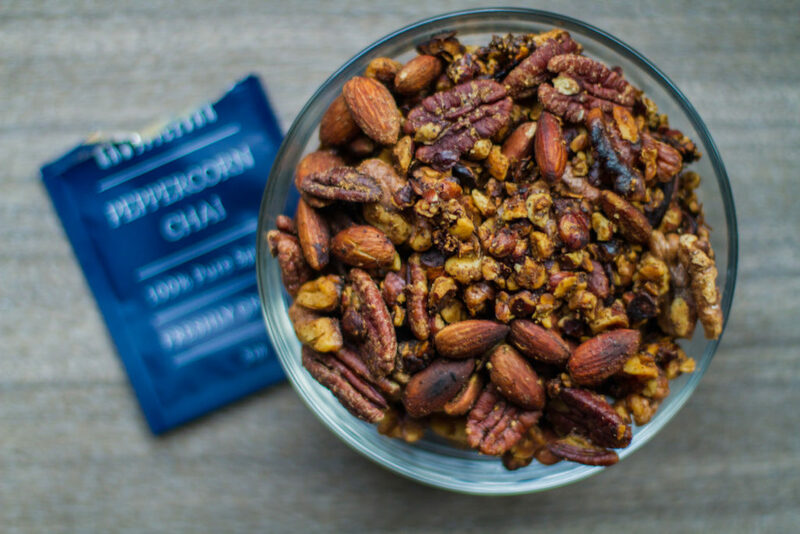 A simple pre-made chai spice mixture makes this snack especially easy to make yourself. Check out the spice section of the grocery store for already put together chai spice blends or buy the individual spices and make your own unique mix. There are variations, but most chai mixtures will have a combination of peppercorns, cinnamon, ginger, cloves, cardamom and star anise. These spices lend big flavor to your nutty snack, so you don’t need to add a lot of salt or sugar. Just a pinch of kosher salt and a teaspoon of maple syrup do the trick. Line a rimmed baking sheet with parchment paper or foil. Set aside. In a small bowl, whisk together the melted coconut oil, maple syrup, chai spice mixture and salt. In a medium-sized bowl, add the nuts and stir in the chai spiced liquid until the nuts are well coated. Spread the coated nuts in an even layer on the prepared baking sheet. Bake until nuts are golden and fragrant, about 20 minutes.